Ahhh, Lisa, do you think I should pack my thirteen year olds lunch like that today? I can just see the middle school kids-he would love it of course...what a great idea! What a cute little fish! 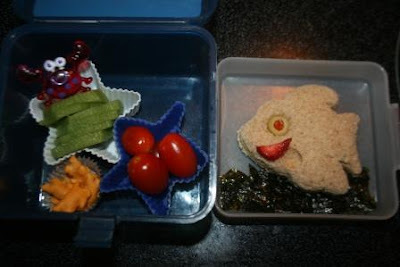 Love the Bento lunches! My kiddos think it is fun and gets them out of the 'sandwich' rut that must kids eat for lunch. Pierce ate the olive I am so impressed. I love olives but I know many adults here who don't. Great lunch again and so healthy. A lucky young boy. Your fish looks really happy about lunch! Your kids one their lunches to treasures that is for sure Lisa. Older boy eats kiwi, but not sure if the younger ones like it or not. I'll have to try. What fun for your son! Very cute!! Ha ha ha.... love the seaweed under the fish. You rock! Awwww, cute! I like your fish more than the Pepperidge Farm fish bread, too! Much better. How did you get him to eat the roasted seaweed? Oh gosh I love the fish! LOVE it. My daughter is excited when I do triangles on her sandwich, I can't imagine how excited she would be if she saw a fish! Cute! How nice to share such fun in a child's lunch! How fun! I love the crabby stick! You are the best lunch packing mama EVER. I love fun food too! Seriously, that looks yummy and so fun. I love the fish-shaped sandwich! the fishy sandwich is so cute!